No matter whether it’s served iced or hot, there is nothing as tasty, refreshing and soothing like a cup of tea. In fact, Tea is the second most consumed drink in the world, right after water (Source). According to research, nearly 25,000 cups of tea are consumed every second which accounts to 2.16 billion cups per day. Tea has been considered as one of the most loved beverages since centuries for a reason. There is a whole host of health benefits tea can offer to our mind and body. 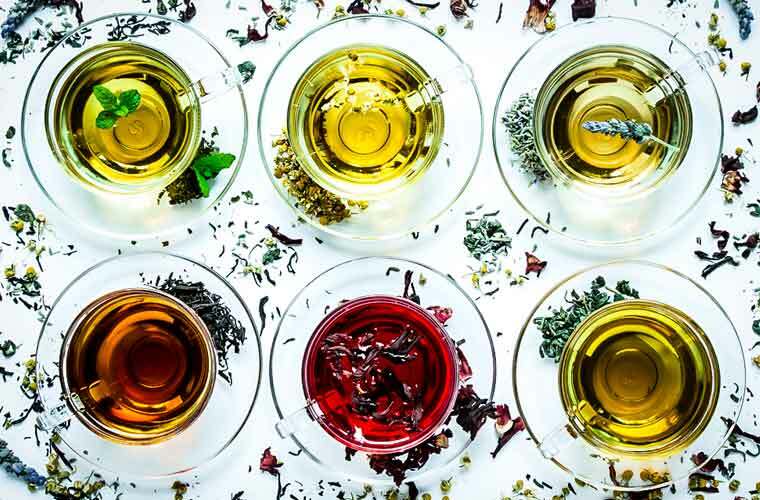 From delighting your taste buds to boosting your mood and from detoxifying the body to trimming your excess fat (which is what we will be talking below about TEA FOR WEIGHT LOSS in full details) - Tea can do it all. Plus, it also helps in warding off some serious conditions like cancer, stroke and heart problems. On top of that, there are different types of teas with a variety of flavors and endless variations. So, there will always be a choice to choose your preferred flavor. 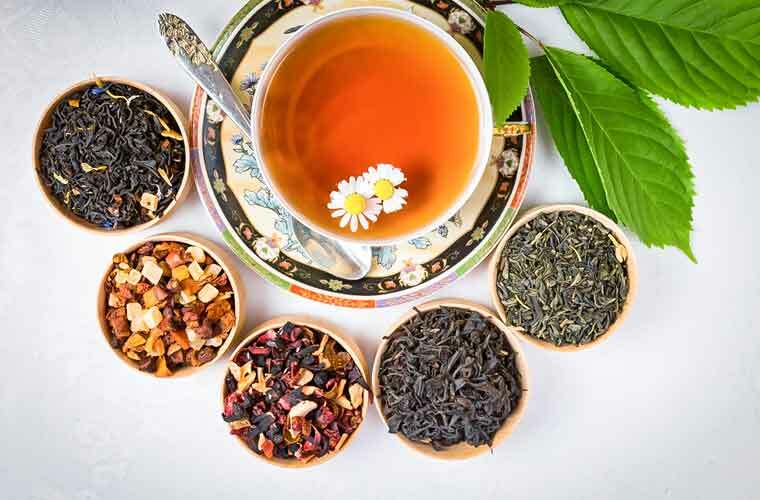 Different types of teas provide different health benefits. Firstly, let’s see What exactly tea is and How it comes? Real or True Tea is anything derived from leaves of Camellia Sinensis plant. Anything else (like Herbal tea) comes basically from an infusion of a different plant and they aren’t technically tea. Herbal teas are most commonly referred to as Herbal Tisanes. Some of the popular Herbal teas include Ginger tea, Peppermint tea and Chamomile tea. 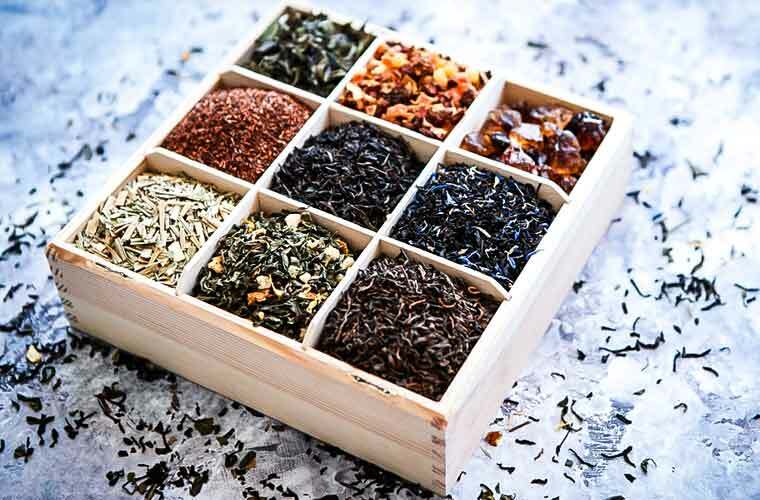 True tea includes Green tea, Black tea, White tea, Oolong tea and Pu-erh tea. Even though they all come from the same plant, the difference in their colour and taste comes from the way the tea leaves are processed. For instance, Black tea is fully oxidized, Green tea is barely oxidized, with Oolong tea being somewhere in the middle as it is semi-oxidized. Tea is a rich source of antioxidants, catechins, and polyphenols. All these compounds have enough positive benefits that will help you live a healthy and better life. It is a well-known fact that metabolism and weight loss are closely interlinked. Metabolism plays a crucial role in the weight loss process. For the people who are unaware, Metabolism is a process of converting the food we intake into energy. And the rate at which we burn calories is called Metabolic Rate. Higher the metabolism more the number of calories being burned. There are certain foods (as we term as Fat Burning Foods) and drinks that boost your metabolism and burn more calories, thus promoting weight loss. And Tea is one among them. Moreover, the best part is, tea is all healthy and natural. Tea contains flavonoids (a type of photonutrient) called Catechins. These catechins boost your metabolism and help your body to break down fats more effectively and quickly. Additionally, the Caffeine present in the tea accelerates the metabolic rate which in turn increases fat burning process. This forces your body to burn more calories. In conclusion, these two compounds in Tea play a prominent role in melting off that unwanted fat from your body. We ♥ being transparent! The post includes Affiliate Links and LiveOsumly earns a commission through the independently chosen links at NO additional costs to you. To know more, You can see our FULL DISCLOSURE POLICY PAGE. 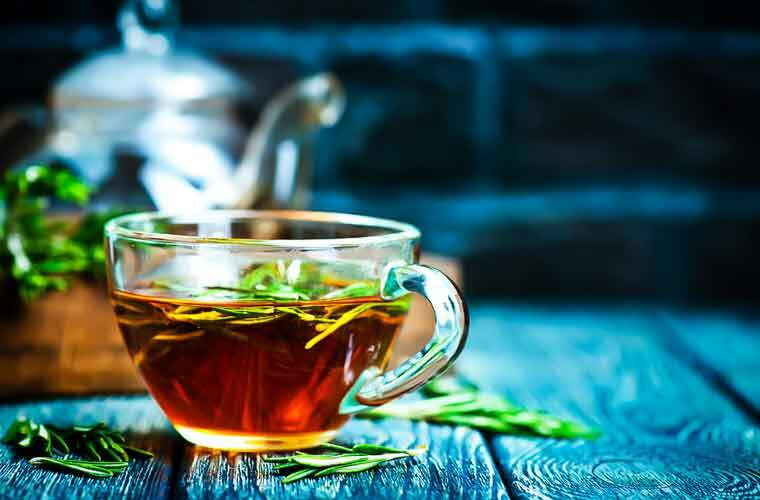 Now that we know how tea helps in weight loss, let’s see some of the BEST TEA FOR WEIGHT LOSS and how they really help you in losing weight in detail. Therefore, without any further delay, let’s jump in right now. Ashwagandha, one of the highly praised natural products, offers amazing health benefits to humans across all ages. Named after Horsepower, Ashwagandha provides immense energy and stamina when used regularly. Having a cup of Ashwagandha tea every day increases memory power by strengthening the nervous system in the most efficient way. Cognitive functioning plays a crucial role in human health and Ashwagandha provides the best possible support in this aspect. Ashwagandha Tea increases the immunity by multiple levels safeguarding humans from bacterial and viral infections at all points of​ time. The antioxidants present in Ashwagandha help to burn more fat by revving up your metabolism. Additionally, Ashwagandha, being a natural product, creates specific levels of heat in the body. This heat created acts as the basic provider of energy and burns the fat in the body in the most efficient manner. 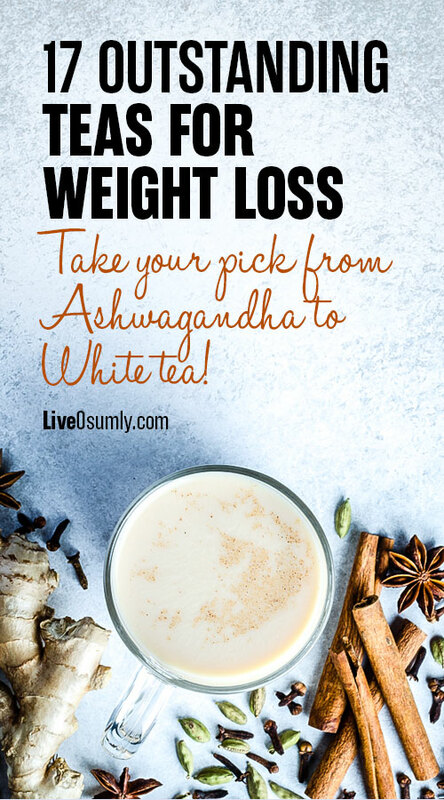 Consuming one cup of Ashwagandha Tea every day will make you lose the excess flab in the body within a short span of time. Heat a cup of water until it starts boiling. Take approximately 2 grams of Ashwagandha root in a powdered form and add it to the water. Boil the mixture for approximately 15 minutes. Separate the tea from the root residue using a strainer. Barberry Tea, among the other tea varieties, has been proved its benefits without any ambiguity. Right from the root bark to the fruit and stem, every part of the Barberry plant offers medicinal benefits. Among the many health benefits offered by Barberry Tea, one of the important and most useful ones is weight loss. It prevents the body from gaining weight by desensitizing the cells that are responsible for accumulating fat all over the body. Barberry Tea is considered as the best option for those whose focus is shedding the extra pounds that make them look flabby. Most parts of the Barberry plant contain a particular chemical named Berberine. This natural chemical helps to burn the fat accumulated in the human body. Berberine lowers down the fat receptor cells in the body preventing them from getting absorbed and accumulated in various parts. Due to the lesser number of receptor cells, the body absorbs only a portion of the fat consumed in the form of food. This portion being minimal, the body experiences weight loss in a healthy manner. Consume 1-2 cups of Barberry Tea every day to lose weight and flaunt your precious curves. Heat a cup of water. As the water starts boiling, add a tablespoon of dry Barberry tea leaves into it. Let the water continue boiling for a couple of minutes. Cover and steep the tea for 15-20 minutes. Black tea is one of the most widely consumed tea in the world. It is derived from Camellia Sinensis plant and is known for its dark color when brewed. It is often blended with other plants to obtain different flavors such as English Tea and Early Grey. As mentioned already, Black tea is fully oxidized which gives it a stronger and bold taste. Black tea contains more caffeine content than other types of teas but less caffeine than that of coffee. 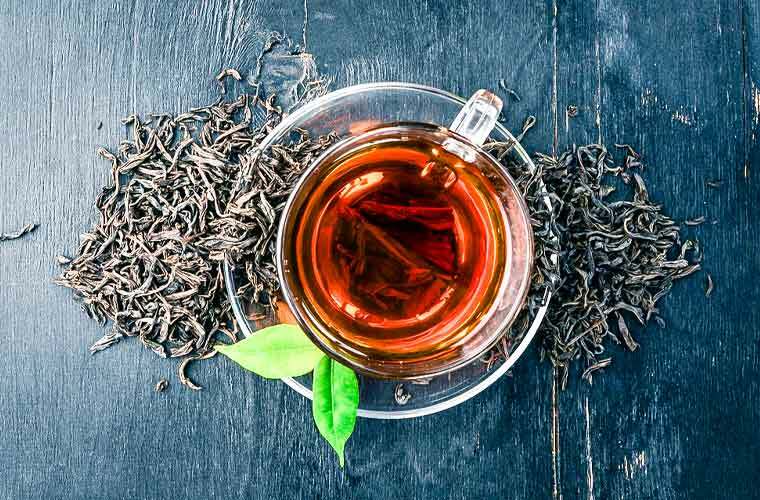 Black tea is a rich source of antioxidants and polyphenols which offers various health benefits such as - lowers blood pressure, prevents constipation and other digestive issues, improves gut health, boosts heart health and also helps in preventing cancer. The polyphenols present in Black tea elevate your body’s metabolic rate and help in burning more calories. Further, they also block fat and prevent it from being absorbed in the intestines. 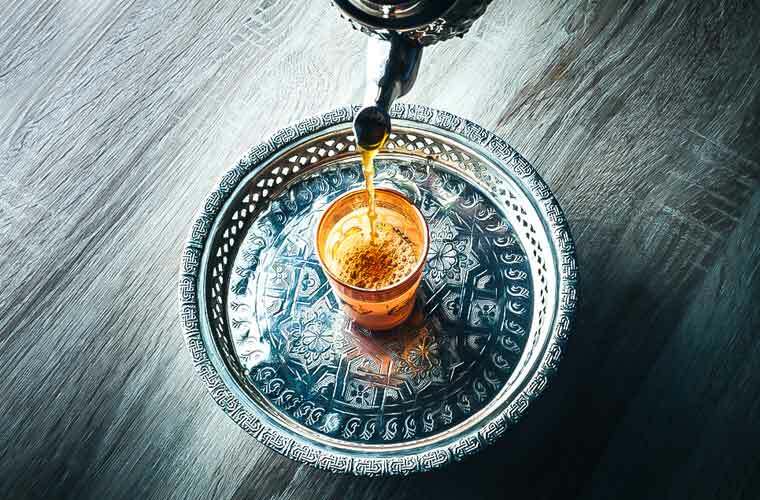 Additionally, caffeine present in Black tea accelerates Lipolysis (the breakdown of stored fat) and it stimulates cycles that metabolize fats. However, adding milk to tea might lower its fat blocking abilities. Therefore, it’s always advised to consume tea without adding milk. Add a tablespoon of Black tea leaves to the boiling water. Let it boil for 5-7 minutes. Strain it into a cup and drink. You can also add more tea leaves if you like stronger tea according to your taste. Known as pot-marigold for its friendliness in adding flavor and color to food items cooked, Calendula is a bright yellow colored flower. The petals of this bright colored flower are dried and sliced for making the same edible. Calendula, in fact, is recommended for quick healing of wounds that get formed in the body post surgeries. It is the Tinctures made out of Calendula that is rubbed vigorously on areas affected by Varicose Veins and Spider Veins. Calendula is also considered as an effective treatment for Duodenal Ulcers and gastritis issues. The anti-inflammatory properties present in Calendula contribute to the good health of the digestive tract in human beings. 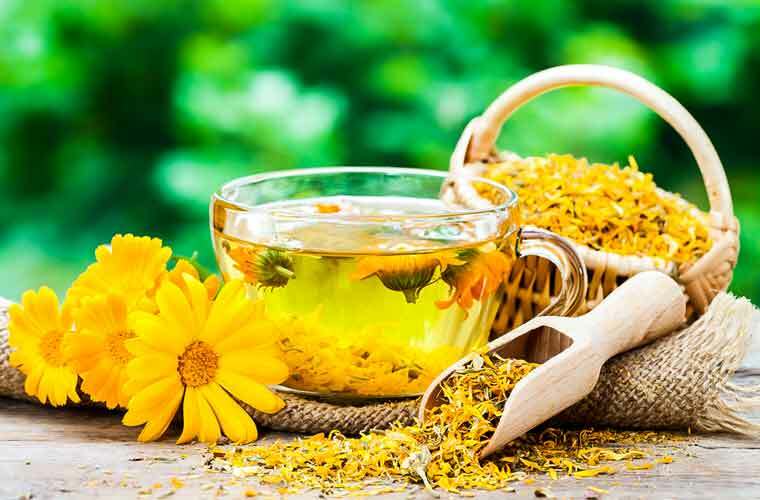 Drinking calendula tea regularly complements the weight loss efforts of people who target to shed the excess fat in the body. Calendula tea speeds up metabolism and improves the digestion process. Further, it detoxifies the human body freeing it from the clutches of unwanted toxins. Not only that, but it also keeps your body hydrated and makes you feel full for a longer time thus preventing you from eating more frequently. Henceforth, Calendula tea helps people manage their body weight in the best possible way. Consuming Calendula tea in the morning and also in the evening helps in effective weight loss. Put 1-2 tablespoons of dried Calendula petals into the water. Cover and leave it for 8 -10 minutes. This light gold shaded tea is mild-flavored. 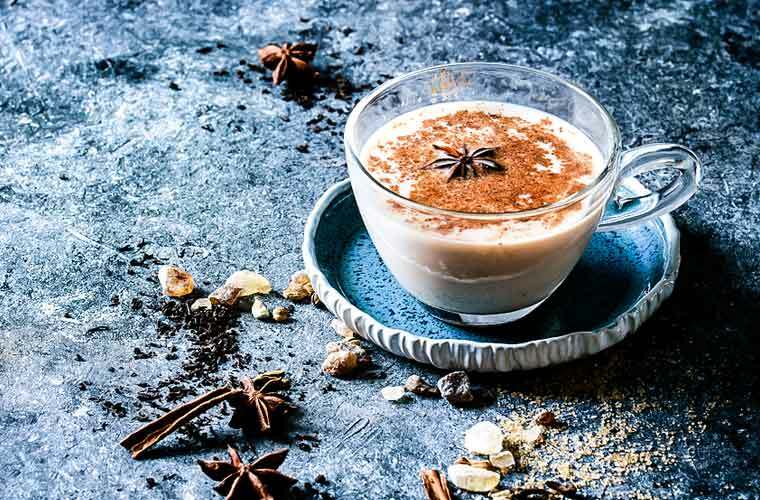 People who prefer to drink heavy flavor can mix two tablespoons of any other flavor like mint or lime along with one tablespoon of dried calendula petals. Rich in antispasmodic and anti-inflammatory properties, Chamomile tea is the golden yellowish liquid liked by many for its pleasant aroma. The benefits Chamomile tea offer to the human skin is incomparable to any other product nature offers. 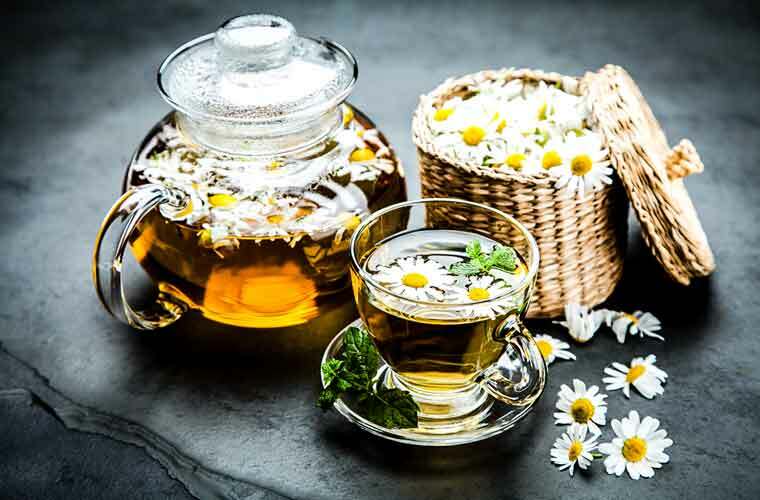 Basically analgesic in nature, many prefer Chamomile tea for the soothing effect it has on the mind and body as a whole. Chamomile tea is very famous for boosting sleep in people suffering from insomnia owing to the effect it has on the nervous system. By enabling undisturbed sleep during night times, Chamomile tea ensures the body gets enough rest needed to maintain optimal levels of energy. Besides, Chamomile tea boosts immunity in human body safeguarding them from cold and various types of infections caused by virus and bacteria. Chamomile tea helps in weight loss by offering thorough support to the digestive system at all points of time. The anti-oxidant properties found in Chamomile tea removes unnecessary toxins and excess water from the body. This not only complements in weight loss but also keeps abdominal bloating under control. The detoxing effect Chamomile tea has on the human body helps adhere to the Body Mass Index (BMI) chart in a perfect path. Further, Chamomile tea acts as a natural appetite suppressant and keeps your hunger pangs at bay. And hence, prevents you from overeating and unnecessary weight gain. Preparing Chamomile Tea is easy and less time-consuming. Heat one glass of water till it reaches the boiling point. Once it starts boiling, turn off the flame and pour the boiling water over the 2-3 teaspoons of dried chamomile flowers or tea bag so they get immersed well. Cover and leave it aside for 5 to 7 minutes. Your Chamomile tea is ready. Strain it into a cup and drink. You can also add a couple of mint leaves along with the flowers. Ginger is a herb but it is most commonly used as a spice and flavoring agent. In fact, it is one of the key ingredients in cooking, especially in Asian and Indian cuisine. It is used as a flavoring agent in food and beverages like juice, coffee, and tea. Apart from making food spicy and tastier, it also has a ton of health benefits. Ginger has been used for medicinal purposes since ages in very particular Ayurveda and Chinese medicines. Ginger does wonders for your stomach problems such as indigestion, upset tummy, vomiting, diarrhoea, gastritis and menstrual cramps. It also works excellent for cold, flu and sore throat. Other benefits of Ginger include - It lowers blood pressure, provides relief for migraine and arthritis, prevents diabetes and cardiovascular diseases. And lastly, Ginger also helps in getting rid of stubborn fat and maintaining a healthy weight. Ginger creates Thermogenic Effect, that is, it increases the temperature of your body and boosts your metabolism upon consumption. And thus, it increases the calorie burning process and helps you burn more calories. 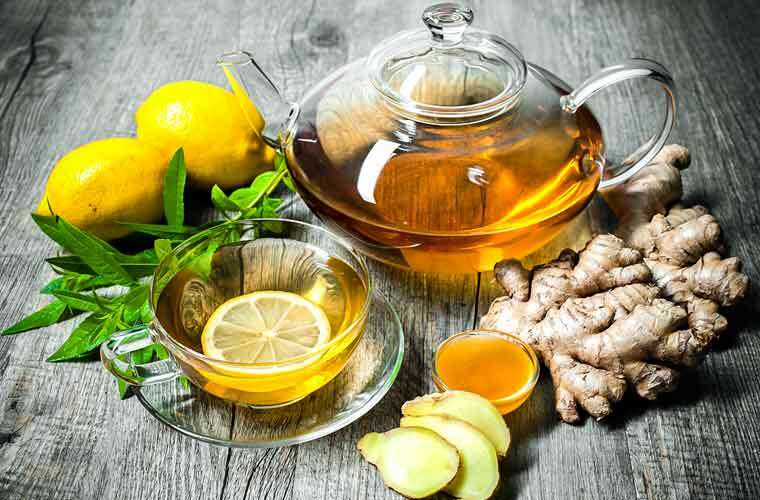 Along with this, Ginger tea increases Leptin levels in the body. Leptin is a hormone that acts as a natural appetite suppressant and makes you feel full and satiated. Thereby, curbing your hunger pangs and prevents you from overeating. Add a teaspoon of grated or crushed ginger to the water. Let it boil for 8-10 minutes. You can add a few drops of lemon juice or a dash of honey if you want. 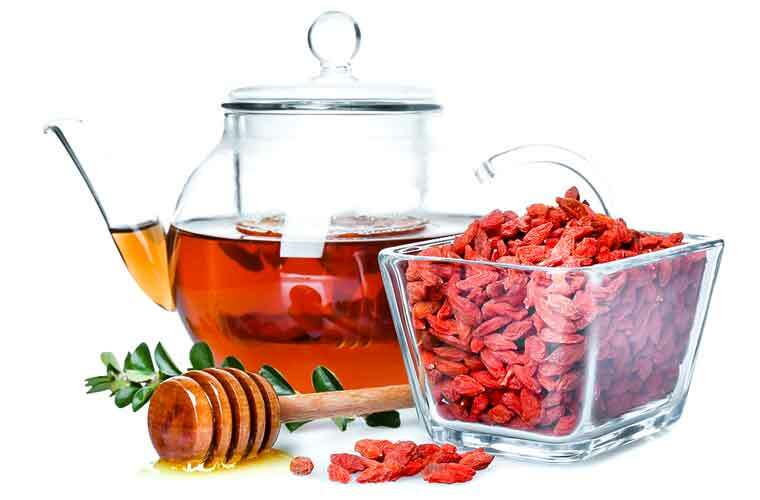 Goji Tea is prepared using Goji berries which are high in fiber content. This makes people feel light and energetic for extended hours of time. Goji Tea is almost a natural product rich in antioxidants and amino acid contents. This safeguards people from inflammation and bacterial infections. The different type of carbohydrates content found in Goji tea controls blood sugar in the most effective manner possible. Goji Berries are high in fiber content. Goji tea controls your cravings and makes you feel full for long periods of time. 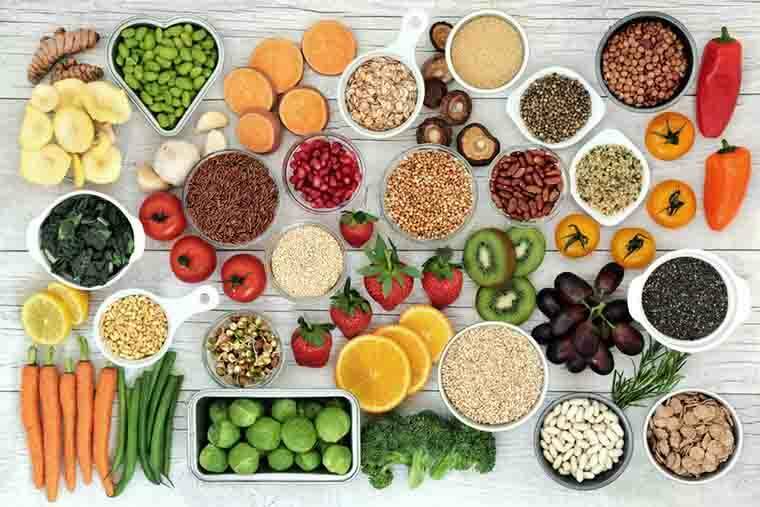 This leads to less consumption of food making weight loss an easy task for people who are health conscious. Goji berries increase metabolic rate which in turn accelerates the fat burning process. Also, Goji tea contributes to effective digestion and eliminates toxins from the body. This ensures that you do not bloat due to gastrointestinal issues. Add a teaspoon of Goji Berries to water. Green tea is one of the most recommended tea for weight loss and fitness enthusiasts absolutely swear by it. Green tea is extracted from the apical leaves of the Camellia Sinensis plant. As aforementioned, Green tea leaves are the least processed or barely oxidized. As a result, those tiny Green tea leaves are packed with powerful antioxidants and nutrients. Moreover, it has innumerable health benefits and does wonders to your health. This includes lowering blood pressure, promoting weight loss, easing digestion, boosting immunity, detoxifying your body and keeping your skin healthy. Plus, it also helps in the prevention of various types of cancers. 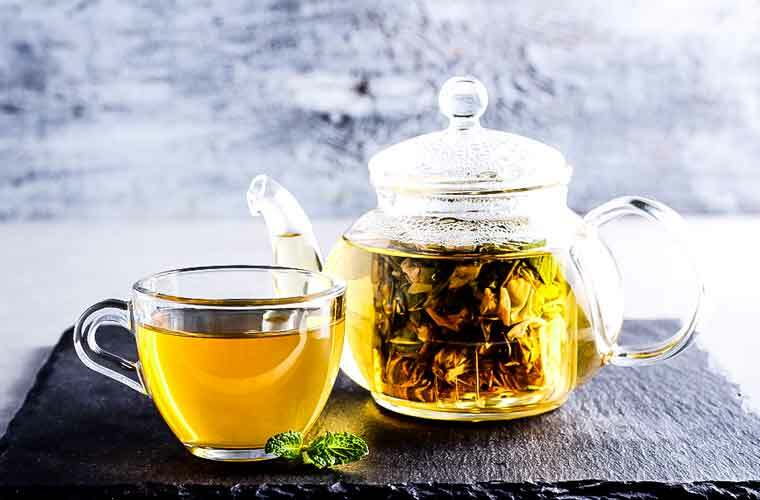 The antioxidants present in Green tea specifically Epigallocatechin Gallate (EGCG) boosts metabolism and stimulates fat burning process, thus aiding weight loss. Further, EGCG contains certain enzymes that release a fat burning hormone called Norepinephrine. This hormone signals the nervous system to break down the fat from the fat cells thereby, speeding up the fat burning process. This fat is then released into bloodstream making it available for use in the form of energy. Besides, Green tea has a low amount of caffeine compared to coffee. However, it is good enough to accelerate Lipolysis and keep you active enough to work out for a longer time. All these properties of Green tea make it one of the healthiest beverages available on the planet. To avail these amazing benefits, all you have to do is just drink 2-3 cups of Green tea every day. Heat a cup of water. Do not let it boil as it will make the tea bitter. So the temperature should be around 80-85 degrees. In case, if it starts boiling, then just switch off the flame and allow it cool for a few seconds. Add a teaspoon of Green tea leaves into it. Cover it and steep for 2-3 minutes. Strain it into a cup or mug and enjoy your Green tea. Add 1 teaspoon of Green tea leaves for 1 cup of water so the ratio is 1:1. In case, if you are using Green tea bags, then 1 teabag per cup will do fine. If you want, you can add honey or a few drops of lemon juice as per your taste. Make sure to add only at the end just before serving. Never boil honey or lemon juice as it will spoil its nutritional value as well as the taste. Hibiscus which is considered as one of the best natural cures adds immense value to human health in many ways. Various parts of the Hibiscus plant offer innumerable health benefits in different forms. Tea is one among those beverages prepared in combination with the Hibiscus plant. Hibiscus tea that is prepared from the dried sepals of the hibiscus plant usually looks red in color. The mixed sour and sweet flavor of the tea makes it a treat to drink for many who are health conscious. Hibiscus tea can be consumed as a hot or cold beverage one depending upon your preference. Referred to as Hibiscus Sabdariffa, Hibiscus tea possesses immense medicinal qualities. The adequate levels of anti-inflammatory properties found in Hibiscus tea aids in blood pressure and cholesterol management. Hibiscus tea works great for lowering overall body weight, body fat, and hip-to-waist ratio. When you consume food that is rich in carbohydrates (which contains glucose and starch) you will gain weight easily. This is where Hibiscus tea comes to help. Hibiscus tea helps in weight loss by lowering the absorption of starch levels in the food items consumed. To be precise, our body secretes an enzyme called Amylase to absorb glucose and starch. Hibiscus blocks the production of amylase and breaks down sugar and carbs for removal. This lowers the absorption of starch and glucose by preventing it from getting accumulated as stored fat. Plus, Hibiscus tea hydrates the body by quenching your thirst and making you feel more satiated. This prevents you from going in search of high-calorie drinks like soda, juice etc. Consume 1-2 cups of Hibiscus tea a day and bid goodbye to your tummy pooch. Add a teaspoon of dried Hibiscus sepals to the water. Allow the mixture to boil. Once the water starts boiling switch off the flame. Cover and steep it for 5-6 minutes. Strain the essence into a cup and enjoy sipping. Based on your preference, you may add sugar or honey to it before drinking. But, for those going in for hibiscus for weight Loss reasons, you can add honey and avoid sugar. Also, for those who wants to overcome the sour taste of the hibiscus sepals, you may add lime or mint. Camellia Sinensis is the base plant that bears the leaves used for preparing Matcha Tea. Growing this plant is a tedious process by itself since exposure to the sun and light spoil the goodness of the tea completely. Steamed in controlled temperatures within hours of plucking, this seasonal tea gets its sweetness through the steaming process. Then the steamed leaves are dried in a natural manner and powdered with the help of stone mills available for the purpose. Very popular among the Japanese, Matcha tea has spread its wings across the globe in recent decades. One among the Green tea categories, Matcha tea helps in body weight management in the most admirable manner on a comparative scale. 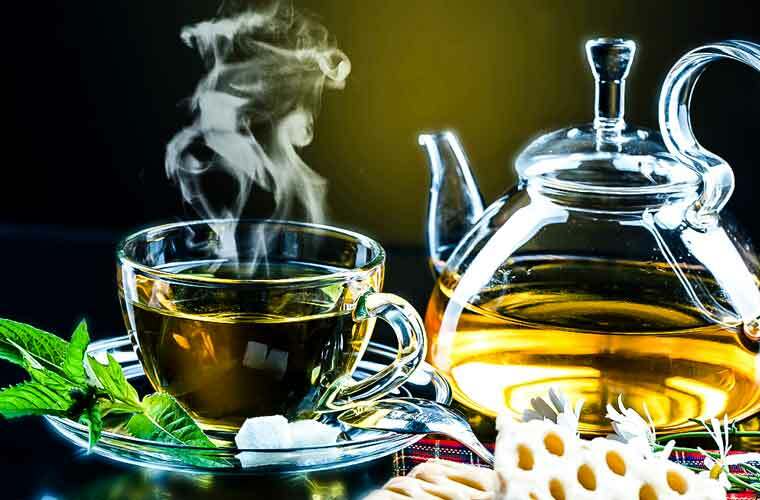 Match tea helps in weight management by boosting body metabolism using the high levels of anti-oxidants present in it. Not only that even the Catechins present in the tea speeds up metabolic rate thereby burning more number of calories. Additionally, Matcha tea prevents the enzymes in our body from breaking the fat content and prevents them from entering into our cells. Being a natural detoxifier, Matcha Tea pushes out harmful toxins from the body making it look fit and healthy. 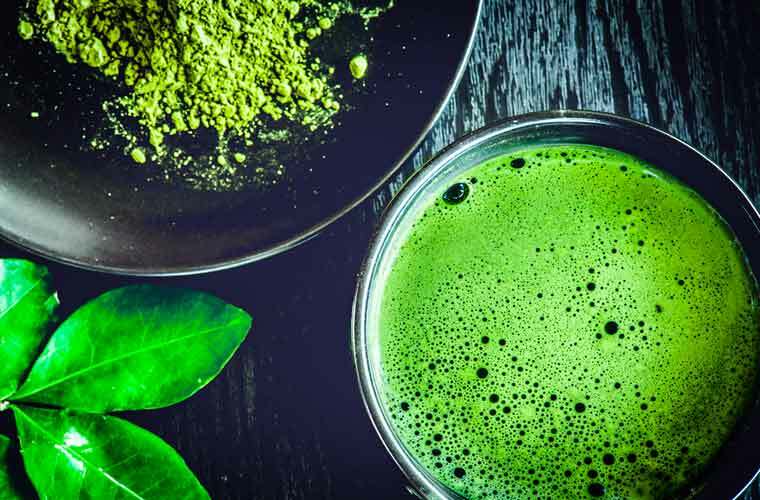 Consuming Matcha Tea regularly controls body weight at healthy levels at all points of time. Heat a cup of water but do not let it boil. Add one tablespoon of Matcha Tea powder to it which is usually green in color. Swish thoroughly using a whisker till froth forms on the surface. Your Matcha Tea is ready to be sipped. Oolong tea is a traditional Chinese beverage that is partially oxidized. The word 'Oolong' refers to 'Black Dragon' in the Chinese language. Hence, it is also known as Black Dragon tea. Oolong tea is obtained from the same Camellia Sinensis plant that is used to make Green and Black tea. Even though they all come from the same plant, they differ in harvesting, processing and oxidation. In case of Oolong tea, the leaves are withered under strong sun and are partially oxidized before subjecting it to curling and twisting. As we know, Green tea is barely oxidized and Black tea is fully oxidized. Hence, Oolong tea falls between Green and Black tea as it is semi-oxidized. Those partially fermented leaves give it a smooth, bold and unique flavor. 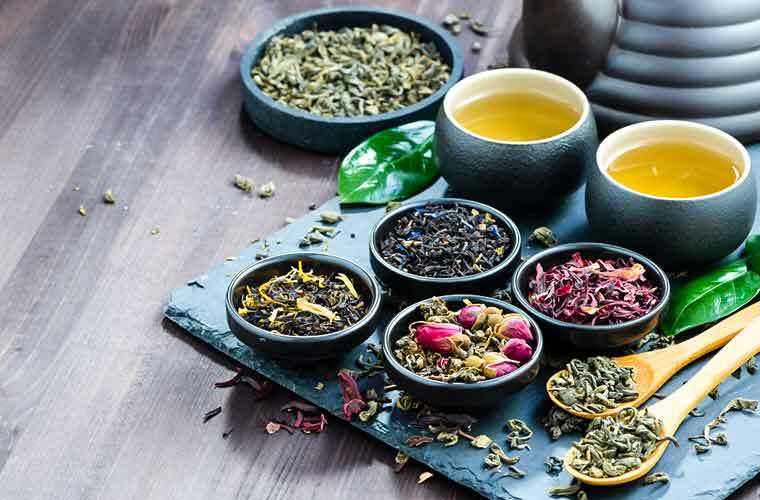 Furthermore, Oolong tea has various health benefits such as it prevents diabetes, aids in weight management, strengthens bones and teeth, healthy skin, improves your overall immune system, prevents heart diseases and helps in stress management. 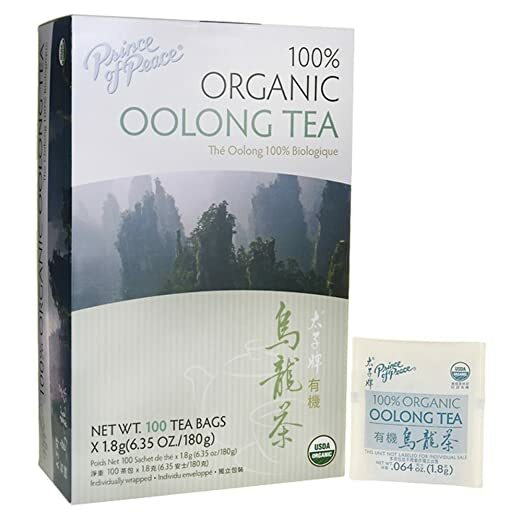 Also, Oolong tea is scientifically proven to prevent ovarian cancer in women. Oolong tea is a rich source of antioxidants. These antioxidants lower the lipid levels in blood and help in boosting your body's ability to metabolize fats. Additionally, Oolong tea is also known to have a certain amount of caffeine that boost metabolic rate and increase fat burning process. This controls your cholesterol levels and promotes weight loss. Consuming Oolong tea along with simple workout will help lose weight easily. Pour the boiled water into a cup. Add a teaspoon of Oolong tea leaves in a cup of hot water. Cover and steep for 4-6 minutes. Strain it and sip slowly. Peppermint is a hybrid plant formed by crossing Watermint and Spearmint. It is an aromatic herb with its main element being Menthol. This menthol is what that gives peppermint an aromatic scent and cooling properties. It is natively found in Europe and Asia. However, due to its remarkable health benefits, it is consumed by a wide range of users across the globe. Peppermint is also referred to as Nature’s Tranquillizer for its amazing medicinal and soothing properties. It is used in flavoring breath mints, candies, syrup, tea, balm, medicines, and chocolates. Plus, it is used as an essential oil for aromatherapy to relieve pain and aches. 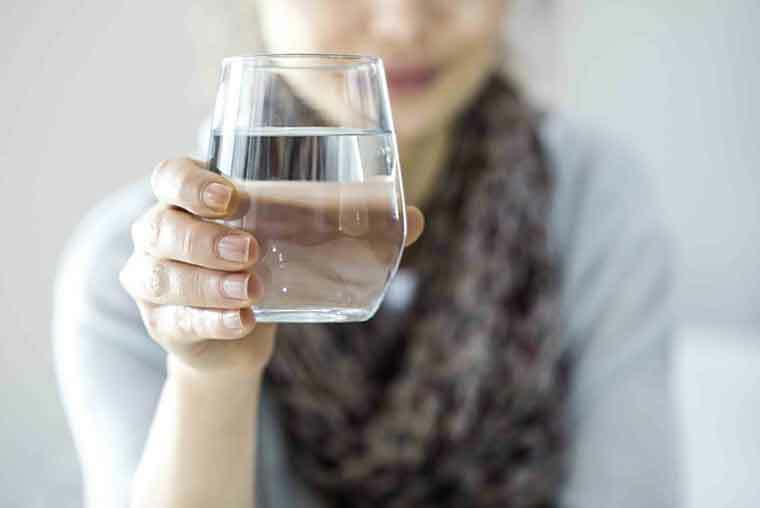 It has various health benefits from suppressing your appetite to improving your digestion, from easing your throat pain to reducing stress and much more. Above all, it has no side effects. 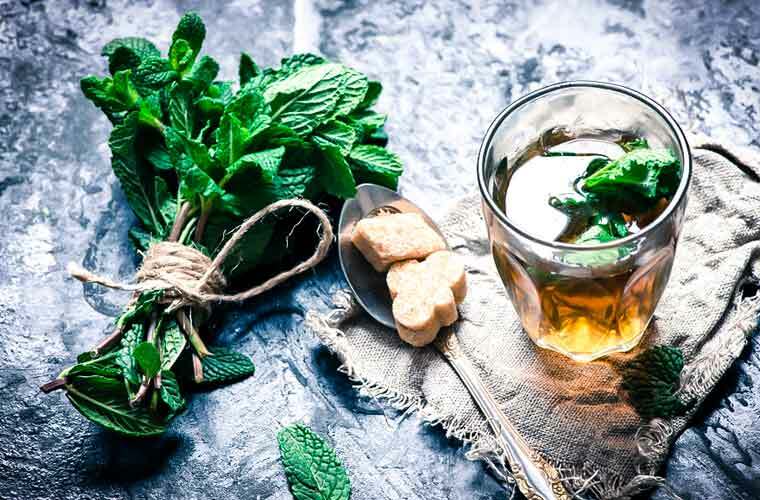 If you are looking to trim off those extra kilos, then Peppermint tea is the way ahead. As already mentioned above, peppermint acts as an Appetite suppressant. The strong aroma and few organic compounds present in peppermint control your appetite by suppressing your cravings. This, in turn, makes you feel less hungry in the long run, thereby, preventing overeating and obesity. If you have sweet tooth, consider sipping on a cup of Peppermint tea instead of having sweets, desserts or other high-calorie foods. You can also blend Peppermint tea with Green tea as it speeds up your metabolism and thus helps in burning more calories. Peppermint can be consumed either hot or chilled. Add a tablespoon of fresh or dried Peppermint leaves (5-10 leaves) to the boiling water. Let it steep for 4-5 minutes. You can add honey or sugar if needed. Pomegranate tea, as the name suggests, is made of Pomegranate - the red colored fruit famous for the array of health benefits it offers. Pomegranate contains adequate nutrients which contribute to the wellness of humans irrespective of the ways the fruit is consumed. Pomegranate tea is one form in which these nutrients can be sent into the body for good health. Consuming Pomegranate tea in a regular manner prevents invasion of cancer in the human body. 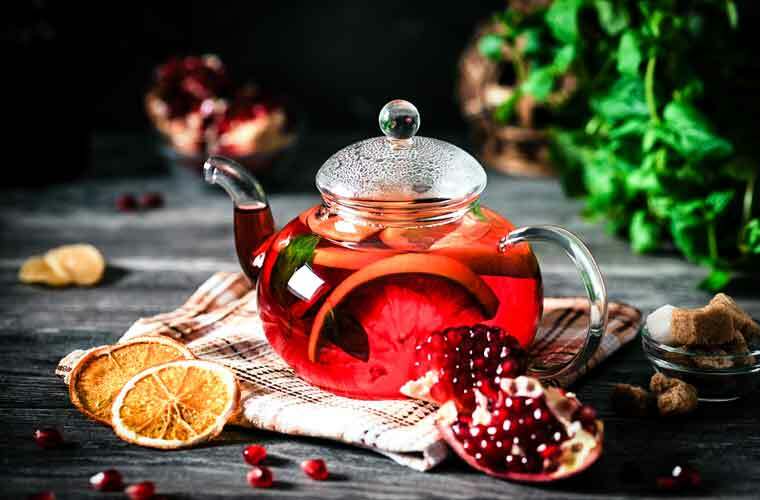 Pomegranate tea plays a crucial role in providing glowing healthy skin to humans apart from aiding them in weight loss. 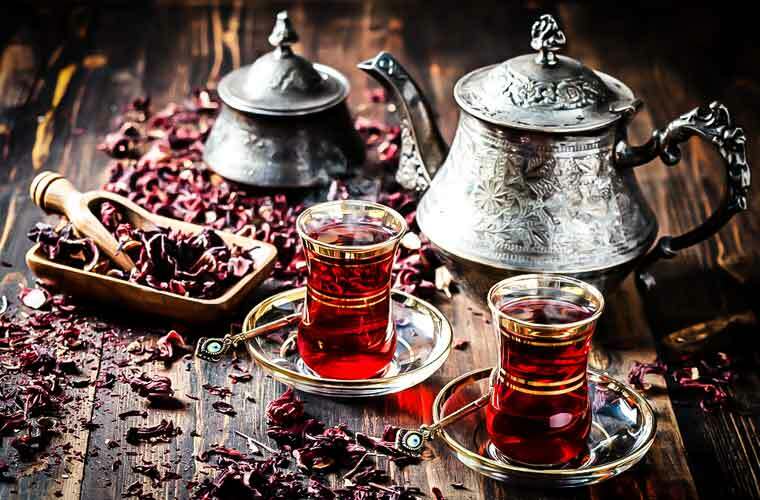 Pomegranate tea contains high levels of Linoleic acid as it is present in the fruit itself. This low-calorie drink fosters weight loss with the help of polyphenols and antioxidant qualities it possesses. The other way through which Pomegranate tea aids weight loss is by suppressing the hunger and preventing you from overeating. Pomegranate tea tastes sweet. This acts as a boon to those who aim for weight loss as it alienates the necessity to add any types of sweeteners. Cut Pomegranate and remove the seeds. Bash or crush the seeds with a ladle. You can either use crushed seeds or you can grind the seeds in a blender and make a juice or syrup out of it. Strain this juice and store in the refrigerator for later use. Bring a cup of water to boil. As soon as it starts boiling remove from the flame. Add a tablespoon of crushed pomegranate seeds or 3 tablespoons of syrup to it. You can garnish it with lemon or mint according to your preference. Also, pomegranate mixes well with most of the teas. So, you can combine it with Green tea, Peppermint tea or any other teas of your choice. Pu Erh, to be pronounced as ‘Poo Air’, is one of the costliest tea available in the market. Generally, tea powders lose their aroma as they age. With Pu Erh, it is just the opposite. The more aged it is, the more tasty and expensive is the Pu Erh tea. Aging gives Pu Erh one of the rarest tastes you can never find in any other forms of teas. Basically a naturally dried tea under the rays of the sun, the leaves are allowed to age after fermentation. The best part with Pu Erh tea leaves is that the same can be used again and again several times. 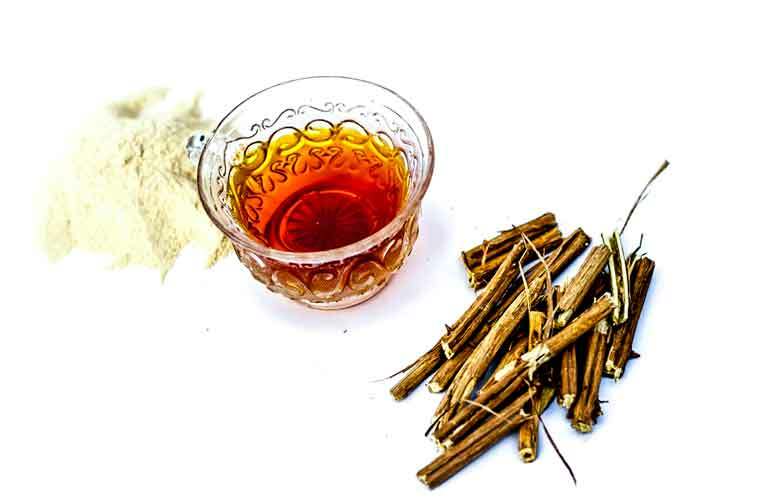 Drinking Pu Erh tea helps in bodily weight management in several ways. When fatty acids get synthesized high levels of fat get produced in the body. Fat, thus produced in the body, gets stored in various parts making you look uncouth and unhealthy. Pu Erh tea has complete control over the fatty acids synthesizing process reducing the formation and accumulation of fat in the body. 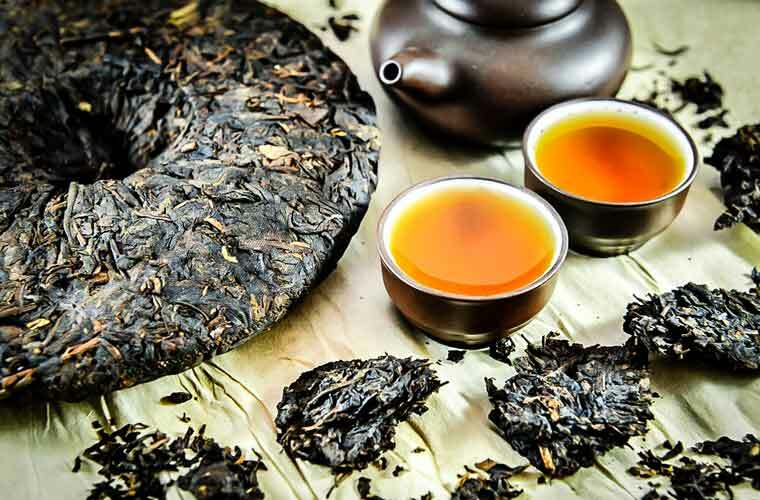 The Epinephrine hormones that are produced on the consumption of Pu Erh tea also suppress the production of fatty acids in the body. Then, turn off the flame and pour the hot water over the Pu Erh tea leaves. After few seconds drain and discard the water. This will remove storage flavor and any impurities in tea leaves. Transfer the rinsed leaves to another vessel. Again heat a fresh cup of hot water. But do not boil this time. Add fresh hot water over these opened leaves. Wait till the color of the water changes. Your Pu Erh Tea is ready to be tasted. Known as African Red Tea owing to its origin from South Africa, Rooibos is basically not one among the general tea varieties. The herb which is basically reddish brown in color becomes a tea when it is dried in a natural manner and powdered. 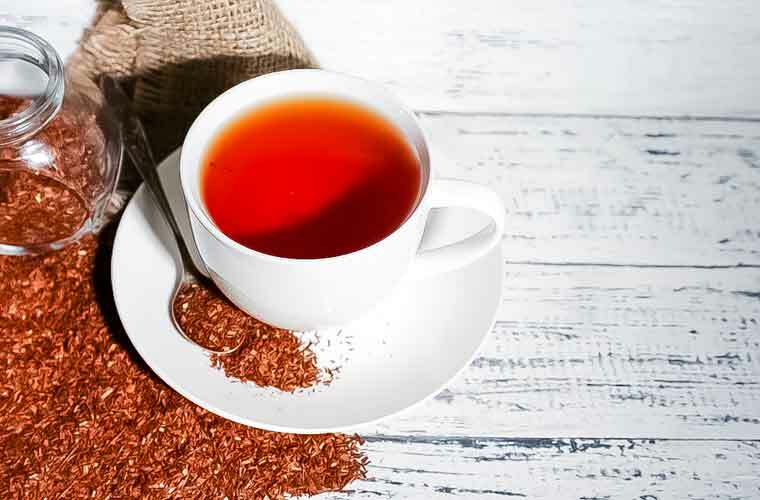 Popular as the Red Bush tea, Rooibos tea provides many health benefits for those who consume it regularly. Rooibos Tea is free from caffeine making it a healthier option among the many other tea varieties. Rooibos Tea has the potential to safeguard people from many chronic diseases like stroke and heart-related ailments. Rooibos Tea is adequately rich in antioxidant and is absolutely calorie-free which is great for those who try to lose weight. 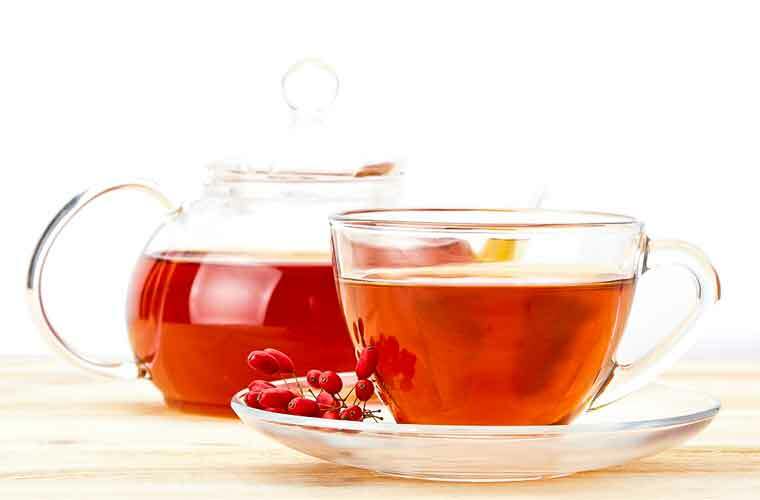 Rooibos tea blocks the formation of new fat cells and prevents fat accumulation. Further, it increases metabolism and detoxifies your body by eliminating harmful substances. Apart from that, Rooibos tea boosts good cholesterol while lowering bad cholesterol from the body and thus, helps your body burn calories. Consuming Rooibos tea once or twice a day regularly shows magical results in body weight loss. Add 1-2 tablespoons of Rooibos tea powder. Cover and steep it for 2-10 minutes. Rooibos flavor gels well with almost all flavors like chocolate, vanilla, and citrus. Add the one you prefer the most. Rosemary, known more for its fragrance is also famous for the uncountable health benefits it provides to human health. High in vitamin B6 and calcium, Rosemary belongs to the mint family. Owing to the heavy fragrance it emits, Rosemary is used in a lot of heavy culinary items like meat and chicken. Regularly consuming rosemary helps in improving memory power in humans while contributing to the good health of the circulatory system. Rosemary also helps in alleviating body pains complementing healthy hair growth in humans. Rosemary Tea can be brewed with fresh as well as dried Rosemary petals. The abundant nutrients present in the rosemary plant secrete an oily substance when brewed in hot water. However, before consuming Rosemary tea, ensure to get appropriate advice from a medical professional. Rosemary tea removes the toxic elements from the body by making it fat and toxic free. The rosemary extracts inhibit Lipase activity and prevent the formation of new fat cells. For people who are unaware, Lipase is an enzyme produced by the body to break down fats. Rosemary tea accelerates metabolism and helps ward off hunger by keeping you satiated for a longer time. Regularly consuming Rosemary tea in the recommended dosage helps in losing body weight to the desired levels easily. Add one tablespoon of Rosemary into it. White Tea is prepared using the powder extracted from the yet to bloom buds of Camellia Sinensis, a famous tea plant. It gets its name due to the process involved in the preparation of the powder. White Tea powder is able to retain very high levels of nutrients due to the minimal processing it undergoes. 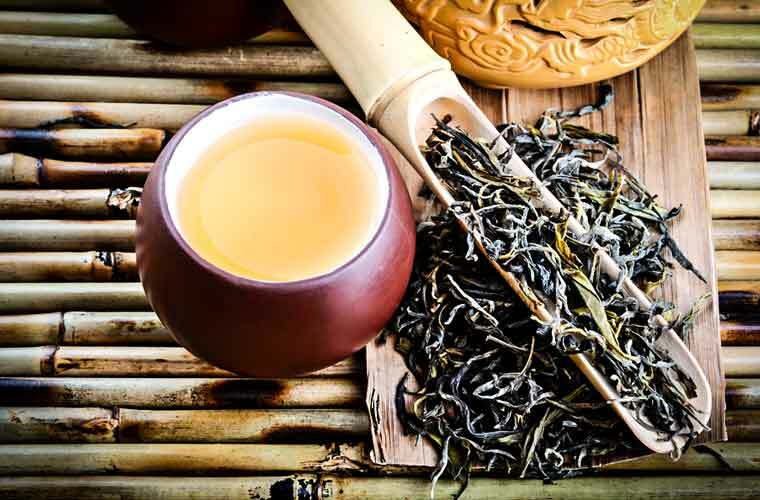 The adequate amounts of antioxidants found in White Tea make it a value-adding agent complementing weight loss efforts. 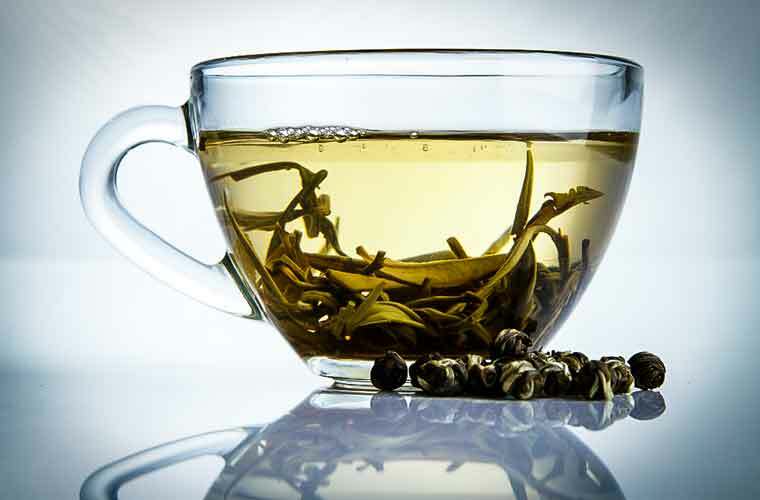 White tea inhibits the formation of new fat cells and prevents it from becoming stored fat. Further, it also breaks down the fat from old fat cells and removes excess fat from the body. 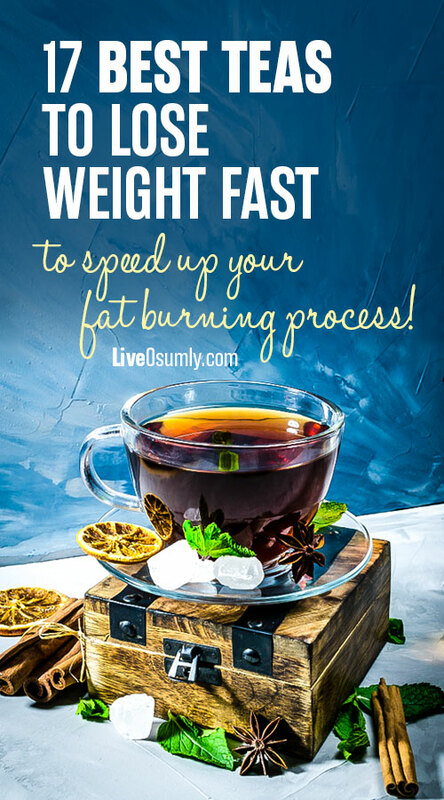 In addition to that, it initiates Lipolysis (the process of burning fat) and stimulates your metabolism thereby burning more amount calories. Overall, White tea helps in getting rid of unwanted body fat and maintaining a healthy weight. Besides, White tea is mild in flavor and has a pleasant taste. 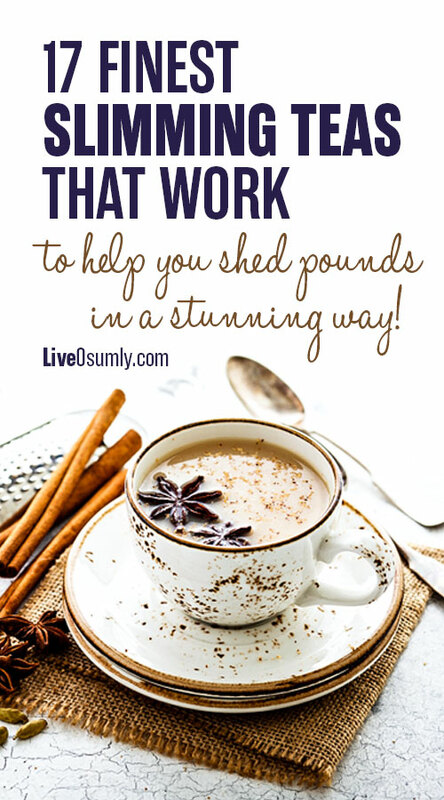 This makes it easy for people who want to shed their excess weight. Heat a cup of water in a container till it reaches boiling point. Once it starts boiling remove from the flame and cools it for 3 to 4 minutes. Add a tablespoon of white tea powder into the water. As the name suggests, White tea appears plain in color. BEFORE DOING EXERCISE – Drinking tea 30 minutes before performing exercise will increase your energy so you can exercise longer. LATE EVENING - 2-3 hours before sleeping. Don’t drink tea in an empty stomach as it will have bad effects on your body. Make sure to consume tea 2-3 hours before you sleep to avoid insomnia. If you are drinking tea to lose weight, then do not add milk or sugar. Most importantly, never drink more than 2-3 cups of tea per day as too much of anything is bad. So, avoid drinking high doses of tea. If you are taking any medication or have any health issues or in case if you are pregnant then please consult your doctor before consuming tea. Lastly, be regular and make it a habit to drink tea every day to get good results and avail its incredible health benefits. If you are trying to shed some extra kilos and slim down your waistline, then consider adding tea in your weight loss routine. 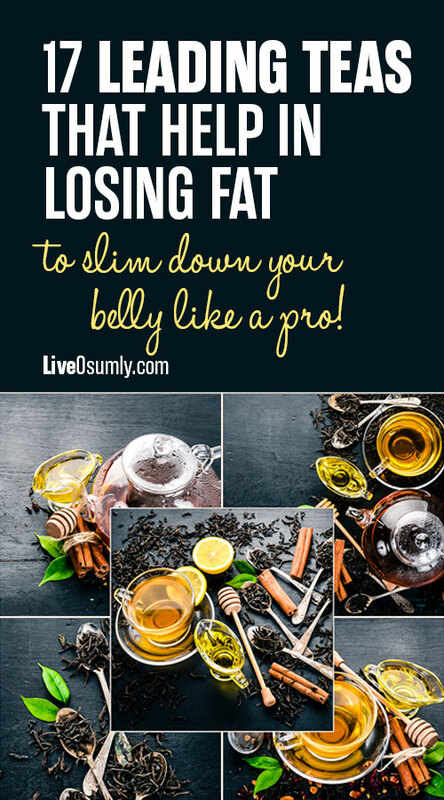 Just drink these amazing teas and perform simple exercises you'll be amazed at how quickly your stomach becomes flat and toned.